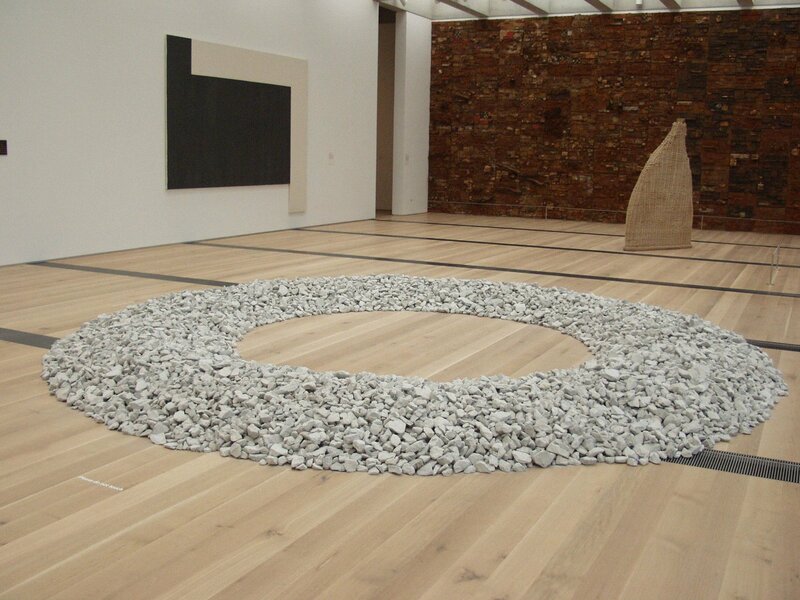 Mississippi Circle by Richard Long is more than just a circle of rocks. It’s a circle of limestone rocks from the banks of the Mississippi River that salutes Missouri’s topography and history. Long somehow got eight thousand pounds of limestone from the Mississippi River and put it all in the Saint Louis Art Museum (aka SLAM) in a circle formation that has an eighteen foot diameter. That’s a lot of rock. Usually Richard Long is more of a walking guy than a rock guy, but this piece is awesome and also encourages viewers to walk around the circle making their own cute little Richard Long work. It’s as close as us plebes will get to being a famous artist. This is not the first time that Long has take materials for nature and put them in a museum setting. His piece a Line in Norfolk is made up of flintstones from the coast in England. He’s taken wood from fallen trees and used it in his work. He allows bits of nature to be taken out of their natural setting and put into an entirely different context, which changes their meaning. But despite all of this Long still believes, as Peter Plagens of Newsweek put it, “Even at its most ecological, art is an intrusion on nature. And the best thing art can do is to give us some sense of what it means to be a human intrusion on this natural planet.” If only climate-change deniers would take a long and hard look at this piece. It’s easy to look at this and see the impact that Richard Long had on other artists, like Andy Goldsworthy and Martin Creed. He makes amazing art and his followers are smart to walk in his exceedingly large number of footsteps.